31 May 2013, Fri (华语讲座Chinese Seminar). Is there a magical i-touch by Apple CEO Tim Cooks in the WWDC conference in 2 weeks time? I am a big fan of Apple. I am more fanatic now that Apple is at $450. It drops from a high of $705 a few months back. 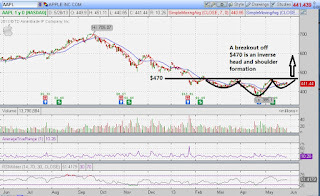 When apple reached $385, we issued an article on Apple, just before its earnings. Indeed, after its earnings day, this stock has not disappointed us. Today it is at $440, up by $70. With the WWDC conference coming up, there might be a tinge of expectation what is inside Tim Cooks sleeves. 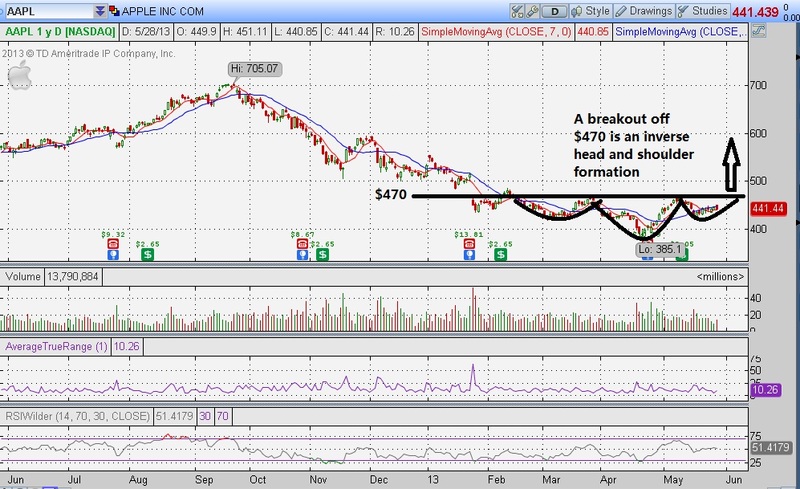 I would expect apple shares to hold above $450 price. 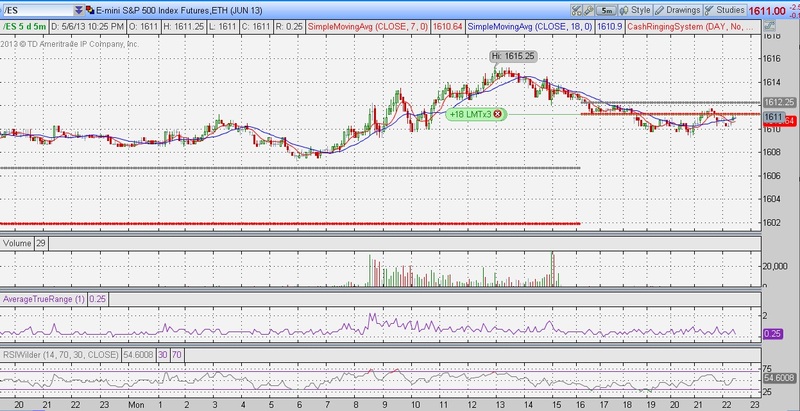 $380.50 is perhaps in my opinion the bottom. In the past, Steve Jobs would roar its audience whenever there is a conference. He would ravish the world with the newest innovations and products. Tim Cooks so far have not done so. Will he do perform this time? Yesterday, Tim Cooks was interviewed in the D11. Let us keep a lookout! My strategy is if Apple share price increases during or after the conference, it is a chance to enter to accumulate some more Apple shares. It seems too good a chance to miss on Apple shares at $400. This is a long term stock play for me. On thursday, we did mention to take note of the next few days after Ben Bernanke speech. 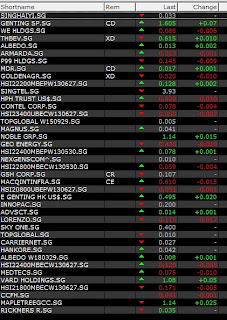 Asia on thursday is bloody with Nikkei dropping 1000 points and Singapore dropping 60 points. But we did mention to take note of 3 factors that might put a halt to DOW. So far, there still is no triple day drop. Dow on Friday actually rises to stop the 2 days rot. So far so good. 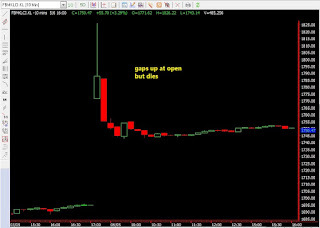 US index did not react that badly to Bernanke speech afterall. This week, let us monitor closely again.I would still stick to the technical analysis 3 factors to tell me if trend has really changed. 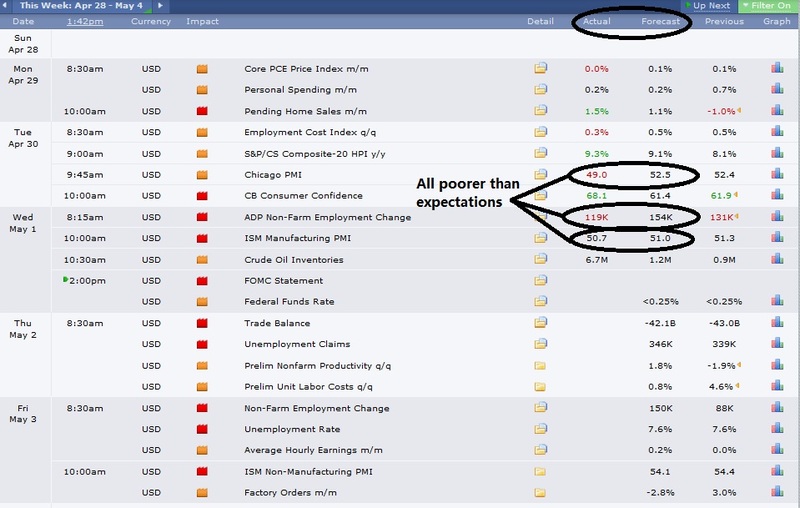 So far looking at fundamental reports give us no clue as poor economic data are considered good news by the market. 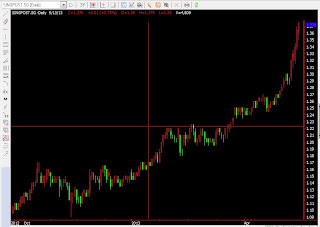 Nikkei hit a block at 16000, we got it inch perfect right! On the 17th May, we wrote an article indicating our view on nikkei index. 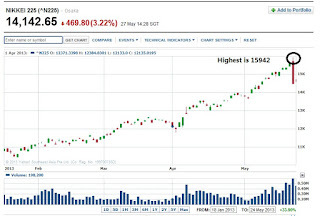 We mentioned that nikkei will hit a deadly cliff at 16000! I mentioned it on Radio 958 when interviewed by Di Cong. 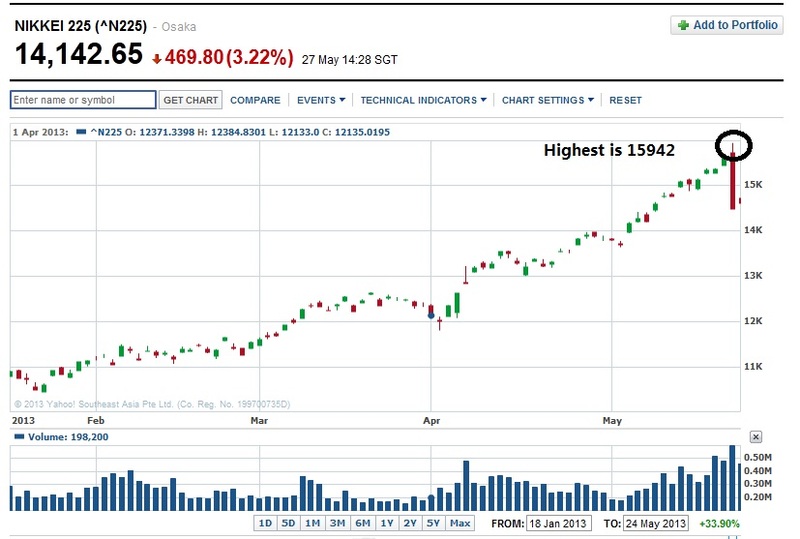 On the 13rd May, Nikkei hits highest during mid day at 15942 before dropping 1000 points!!! 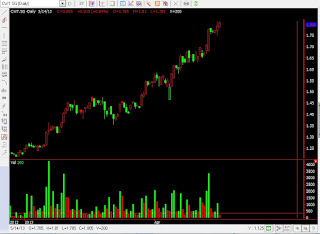 Today Nikkei is at 14612. What a big drop to the best performing index in Asia. It was still powering forward when I wrote the article. So what will happen to this index? We feel that it might consolidate for a while. 16000 is a difficult barrier to exceed, even with all the QE promises and the popular "Abenomics" method. It needs a rest. However as the index drop so much these few days, we feel that 13600-14400 might be a good point to enter for some short term gain. 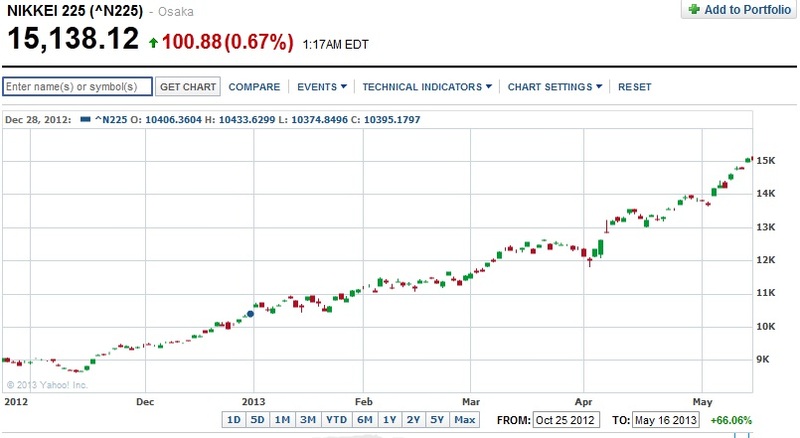 At 13600, you might want to seriously pick up some Japanese stocks. 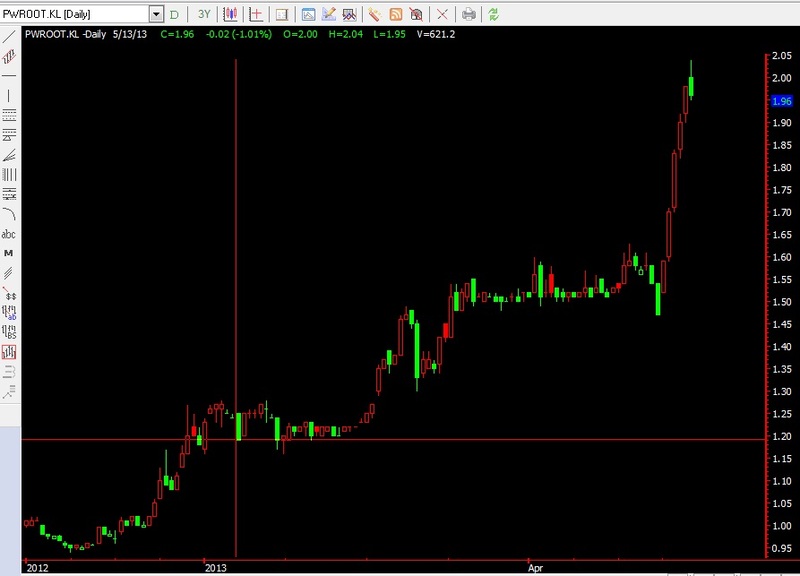 Starhub is an uptrending stock. 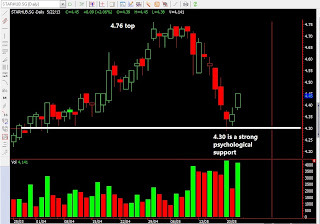 Recently it seems to stop falling at 4.30, a good psychological supporting price. We think that there may be a chance for a rebound. Disclaimer: Do take note that this is for reference only. Kindly study this stock yourself before making a decision. 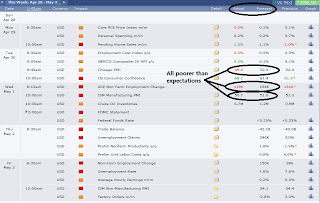 Will Ben Bernanke and the Fed family push US stocks higher this week? The wily Big Ben, the master of stock market psychology is preparing his script again this week. Let us see what he has to said. In the past, I have already said that I am a big fan of him as I think that the stock market will continue to grow under him. He knows how to use the media to his advantage. Together with Obama, they are a marvelous pair. Thank them for today's all time high! Even President Abe and Japan is learning from the FED now. 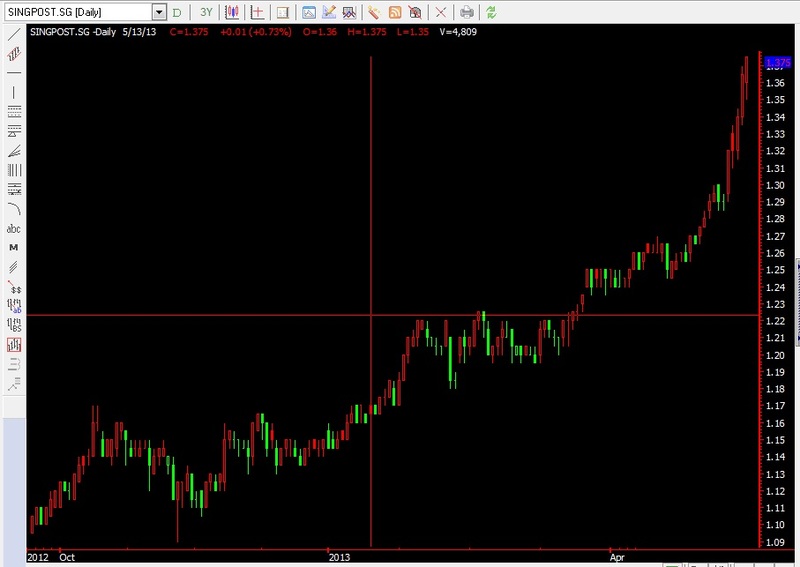 See how Japan is gaining the momemtum in fanning the pro stock market policies! That is the reason y Nikkei has gained 70% in 6 months. This week Big Ben will again have a chance in addressing the audience. I would like to see what he thinks about the economical condition and the stock market high. I think the market will welcome him more if he said that the QE will continue as the economy is picking up slowly but steadily and no sudden halt to QE plans will happen soon. US stock tip: A reason why Warren Buffett still likes Banks! If you are talking about long term investments, you should look at the banks in America. 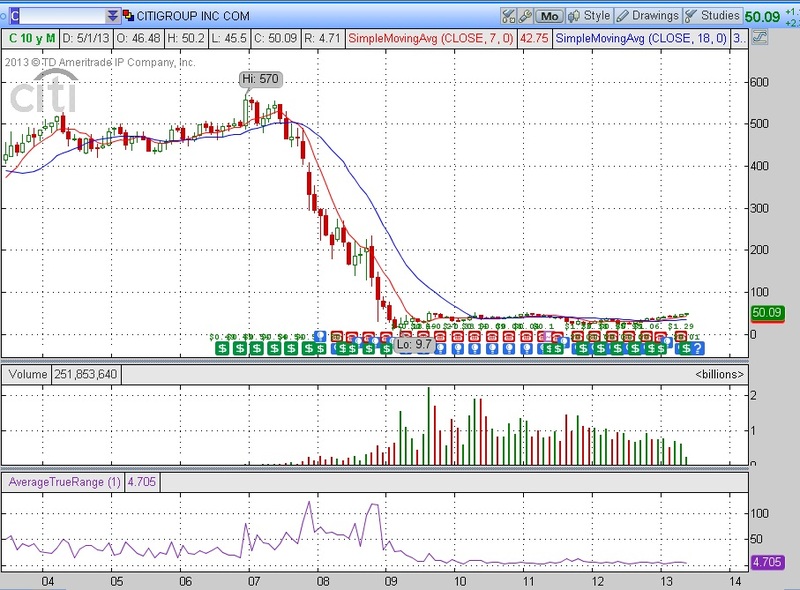 As an example, Citigroup is still far from its heights of $570 in 2007. Current price is only $50. 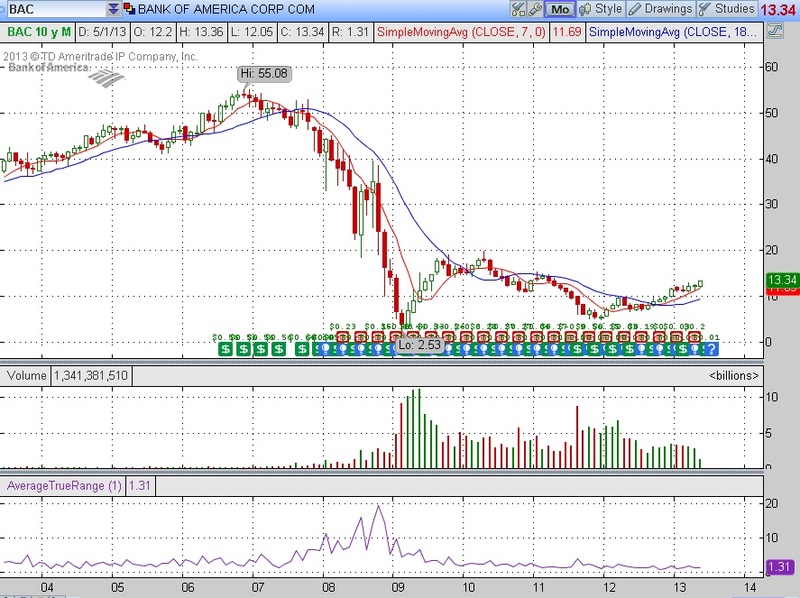 Bank of America is still far from its height of $55 in 2007. Now Bank of America is just $13. No wonder, Warren Bufffett continues to speak good about the banks. Currently he has positions in Wells Fargo, US Bancorp, Bank of New York Mellon, and holds tons of warrants on Bank of America and Goldman Sachs, which can be converted to shares anytime. 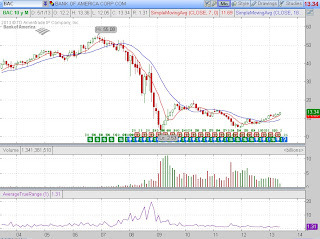 Long term wise, we continue to believe that Bank of America is a worthwhile retirement stock. Grab the opportunity of owning it, should it falls everytime. US economy is recovering! And Ben Bernanke monetary policy is working, so says Warren Buffett. If you believe in US economy, believe in the BANKS! On 16 May 2013, Thu (English Seminar) or 17 May 2013, Fri (华语讲座Chinese Seminar). Do you remember our malaysian recommendation of PWroot a couple of months back when it was $1.50? In Jan it was $1.20 when we recommended. It has reached $2.04 highest today. We now feel that this company needs a rest at $2. 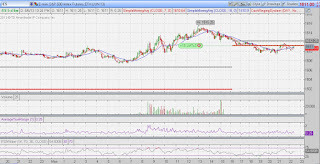 We think that it has the possibly of hitting $2.10 the highest before consolidating. 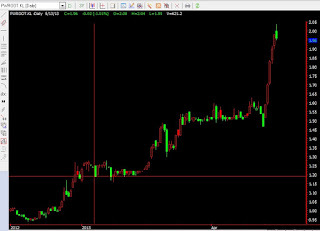 This is a strong powerful stock, however a consolidation may be the right way before moving forward. On 9 May 2013, Thu (English Seminar) or 10 May 2013, Fri (华语讲座Chinese Seminar). 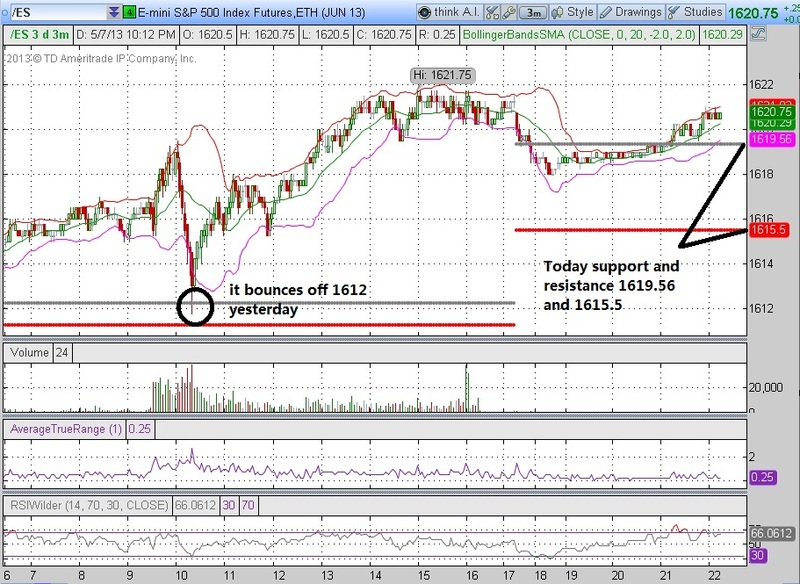 Yesterday when S&P500 futures breakout through 1612, it continue its upward movement to reach 1620. 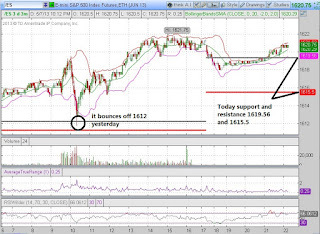 Today it seems like S&P500 would likely continue its bullish momentum if it stays above 1619, one of the support for today. if it breaks below, 1615 remains the next support. 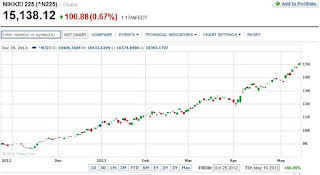 With China good results, we anticipate S&P500 to be likely above 1619. Today might face some resistances at 1611.25 to 1612.25 region (Grey and Red lines are today's resistances or support). If Europe opening isn't good in afternoon, we feel S&P500 have a chance to be down today. Having said that, if it breaks out of 1612.25 esp during opening hours of europe and US, S&P500 have a strong chance of upside. One month ago on 11 April, we wrote an article in a malaysian newspaper about the strategy before and after election. A glimpse of the draft that we send to busy weekly in mandarin. We did mention that before the election, KLCI should be above 1700. We predicted that when BN wins, the index would definitely gaps up at the open. But do not go in to catch the euphoria. It might be a bit late. Wait for the pullback. Study all the stocks that have performed well for its earnings this season, and put it in the trading diary. These are the stocks to watch out for. 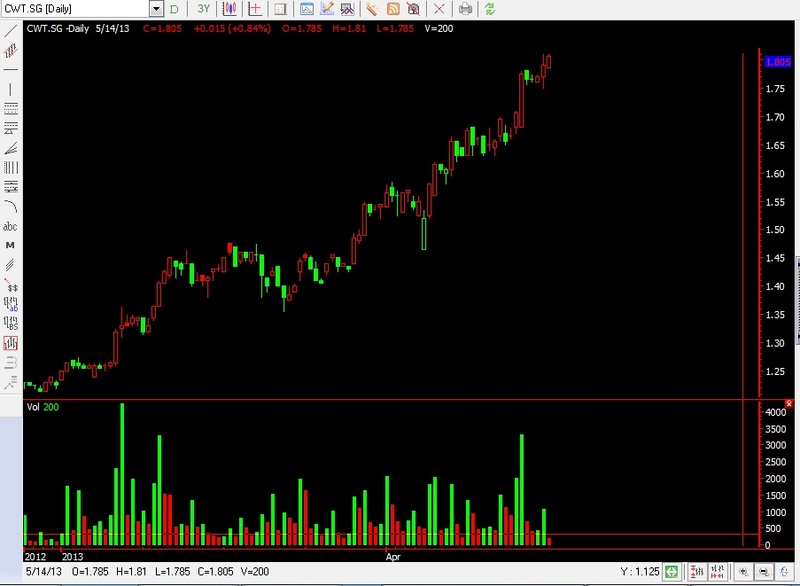 Indeed today KLCI gaps up at the open amid the good election results for the BN, reach a high of 1826 within fist 5 mins, but drops to 1750 now. So what is the strategy now? My guess is this index needs a big big rest now. 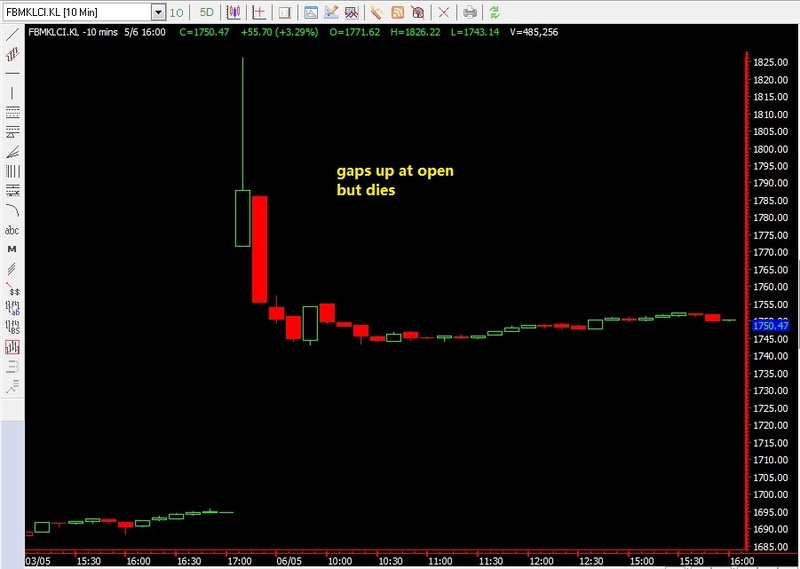 I initially has hope of an unfavorable result so that I can buy upon the gap down. It has not occurred, and now, we probably have got to be patient. Election is over, now everything is back to normal. 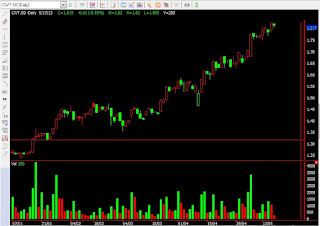 KLCI will follow US market more closely now. 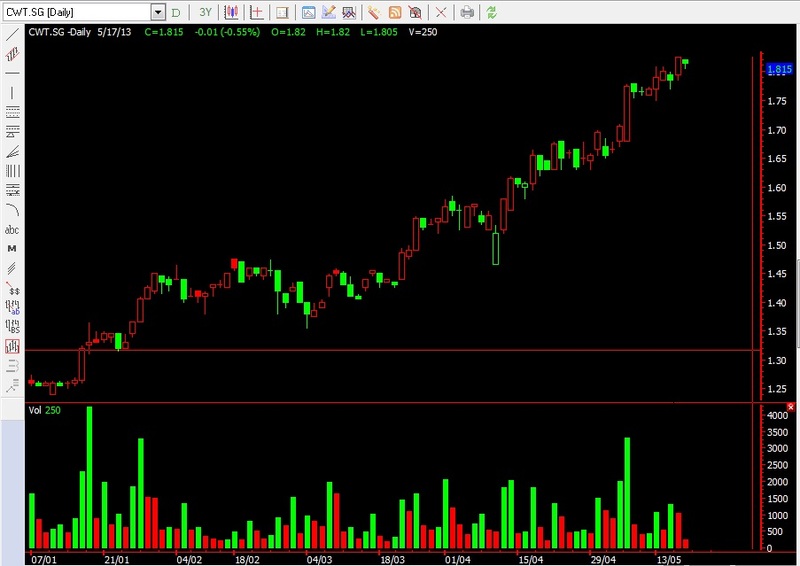 Let us see if US market consolidate. If so, KLCI will follow suit. DBS powers STI to 3400! But did most stocks gain? It seems today is a marvelous day for STI! Going up 31 points when Dow drop 100 yesterday. Thank you DBS for the 70 cents move. Today DBS issued an overwhelming earnings results. 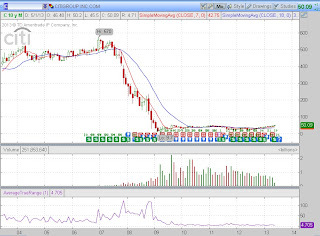 However it seems that not all stocks are gaining when looking at the Top 40 volume. Do remember that Earnings season is the point in time where we take a look at our portfolio again. Put all the good earnings stocks down in your trading diary. These will be the stocks that are going to outrun and outclass the poor earnings stocks this season. Do remember that banking stocks have done relatively well in last quarter results. That is the reason they continue its run these past 2 months. 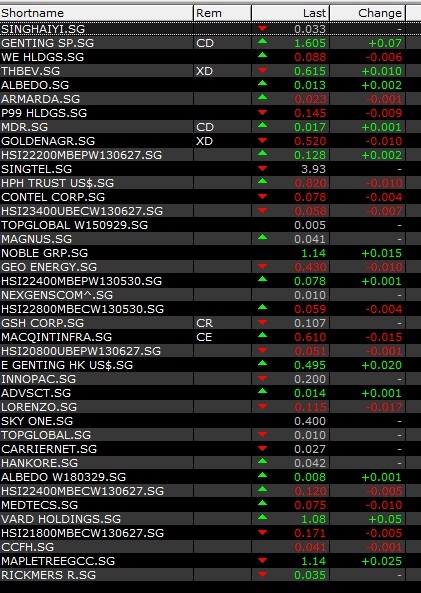 OCBC results have not been fantastic. 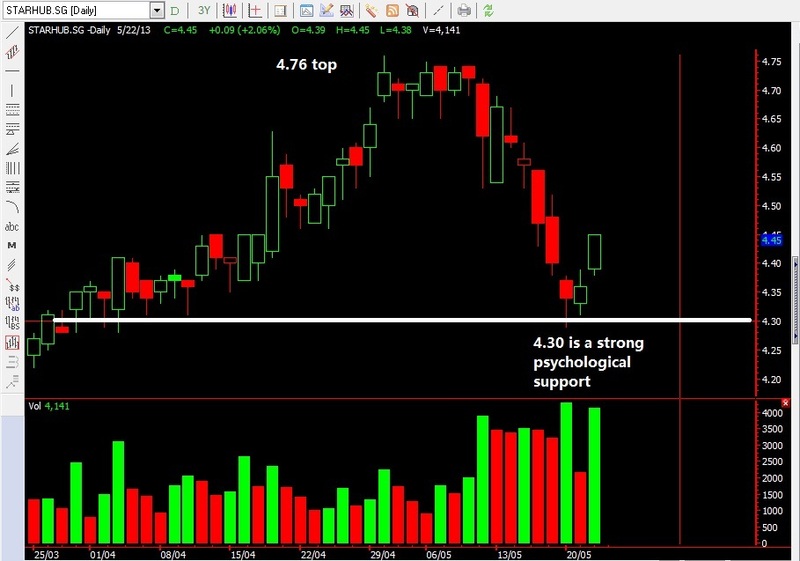 Let us take a look at UOB next.